In the middle of every good news hockey story there seems to some nit-picking, mean-spirited, nay-sayer who tells you why it isn't good news. In the case of the Detroit Red Wings record home winning streak, that person would be me. 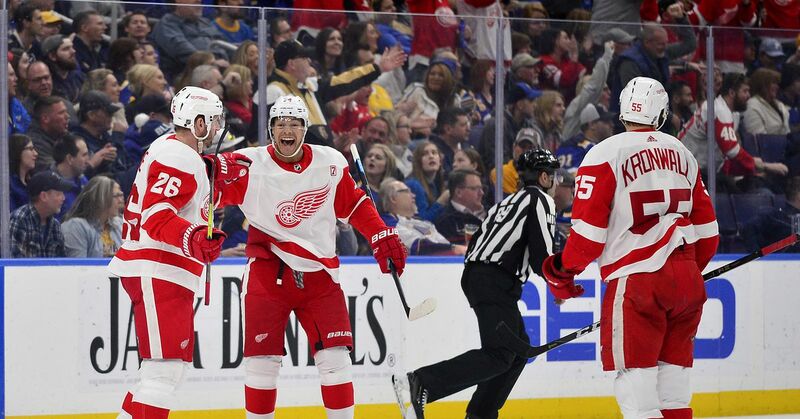 Last night the Detroit Red Wings won their 21st consecutive home victory surpassing the old record of 20 wins held by the 1929/30 Boston Bruins and the 1975/76 Philadelphia Flyers. The problem, of course, is that what constituted a win for these three teams was different each time. The NHL changed what constitutes a regular season win is and yet wins from different eras under different rules count as the same thing. This is a classic case of wanting to have your cake and eat it, too. You can try, but don't ask me to swallow it. When the Philadelphia Flyers had their 20 game home winning streak back in 1976 the only way to win a regular season NHL game was to beat the other team in regulation time. If you weren't ahead after sixty minutes the game was over. It wasn't until the 1983/84 season that the NHL introduced a five minute overtime period for games that were tied after 60 minutes. Now what would have been a tie in 1976 could become a win or a loss. After the NHL lock-out that saw the loss of the entire 2004/05 season, the NHL changed their overtime so the teams played with four skaters and a goalie per side instead of the normal five skaters and a goalie. If the game was still tied after that overtime the winner was to be decided by a shoot-out. The shoot-out is dramatic, but it's not playing hockey. The equivalent in baseball would be playing an inning or two of seven man ball when a game was tied after nine. If that didn't settle things then go to a home run hitting contest. That might be interesting, but it wouldn't be playing baseball. The shoot-out is an interesting skills exercise but it is not playing hockey. A team that wins a game in overtime or by winning a skills competition has not done the same thing as a team that won their game outright in 60 minutes. Any attempt to compare the Detroit Red Wings winning streak to the Philadelphia Flyers streak is doomed to failure. You are comparing apples to oranges and pretending they are the same thing. The Detroit Red Wings started their current winning streak back on Nov. 5th with a Saturday night 5-0 shutout of the Anaheim Ducks. They then reeled off 11 more regulation time victories for a 12-game winning streak. Next, though, came a shoot-out victory over the Phoenix Coyotes and an overtime victory over the Chicago Blackhawks. After a 5-0 win over Buffalo, they won 3-2 over the Columbus Blue Jackets in yet another shoot-out. Last Friday night they beat the Ducks 2-1 in a shoot-out. All four of these "wins" would have been ties back in 1976. Using 1976 standards these Red Wings have a 12-game home winning streak—impressive, but not record setting. The Detroit Red Wings do have a 21-game home undefeated streak, in any era. The record for the NHL undefeated streak at home is held by the 1976/77 Montreal Canadiens at 34. Ironically enough, the overtime and shoot-out which has made it easier for modern teams (2005/06 on) to have longer winning streaks also makes it more difficult for those teams to have longer undefeated streaks. The overtime and the random nature of shoot-out results gives opponents extra chances to defeat you every game that didn't exist between 1942 and 1983. The 1929/30 Boston Bruins also are credited with holding the record for most consecutive home wins. Unfortunately they set their record in an NHL era that saw a 10-minute sudden death overtime after a tie in regulation during the regular season. If the current day Detroit Red Wings' and the 1975/76 Philadelphia Flyers' wins are apples and oranges, then the Boston Bruin home wins back in 1930 are some sort of statistical bananas. They can not be counted as the same thing and they aren't the same thing. The Detroit Red Wings hold the record for NHL regular season wins in the shoot-out era (2005/06 on). They are riding a 21-game home undefeated streak in any era. To best the 1975/76 Philadelphia winning streak at home, a team has to win 21 games in a row in regulation time. The Philadelphia Flyers by any objective standard still hold the record for most consecutive home wins in the regular season.